Bright and sharp in the publishers gilt and blyue cloth, this is an illustrated collection of short stories selected from earlier works including: ‘With the Main Guard’, ‘Drums of the Fore and Aft’, ‘The Man Who Was’, ‘The Courting of Dinah Shadd’, ‘The Incarnation of Krishna Mulvaney’, ‘The Taking of Lungtungpen’, ‘The Madness of Private Ortheris’. With twenty-one full-page black and white illustrations by A. S. Hartrick, and woodcuts as head and tailpieces at the beginning and end of the chapters. 1890 - United States Book Company, New York - First Edition of Barrack-Room Ballads, First American Edition of Departmental Ditties. First Issue. 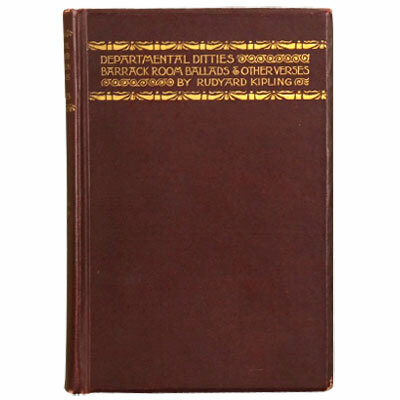 A sharp bright example of this large collection of Kipling’s classic verse, 66 in total, a compilation that includes the first printings of thirteen ballads and four ‘Other Verses’ printed two years later under the separate title of ‘Ballads and Barrack-Room Ballads’. Most proving that we never learn, and many reliving the experiences of soldiers and civil servants sent around the world to defend the Empire, all for little pay and less appreciation. ‘When you’re wounded and left on Afghanistan’s plains, And the women come out to cut up what remains, Jest roll to your rifle and blow out your brains, An’ got to your Gawd like a soldier........’ – The Young British Soldier.